Experience Charleston the way it was meant to be seen, from the water! 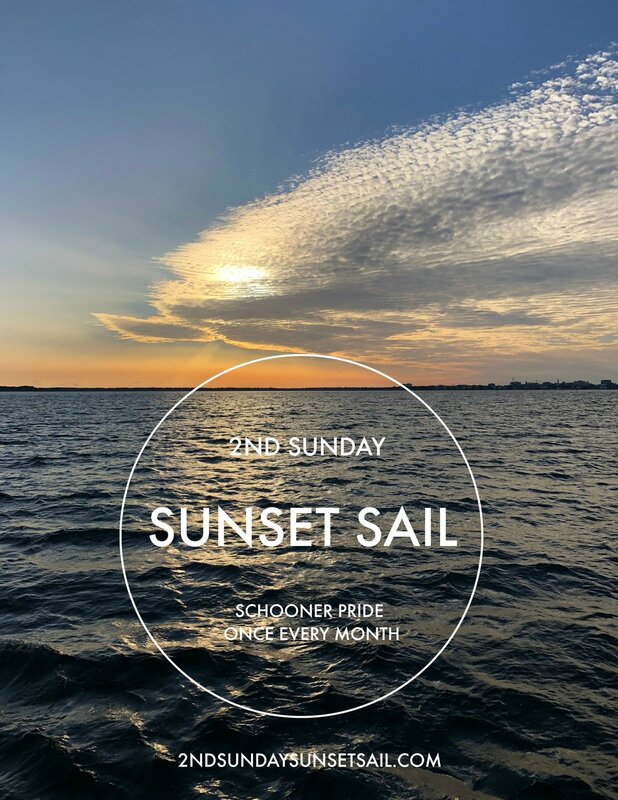 Board the three-masted Tall Ship Schooner Pride for a relaxing two-hour evening sail in Charleston Harbor during our oh-so fabulous monthly event, the 2nd Sunday Sunset Sail. Experience the wonder of sailing Charleston Harbor while the sun sets on this classically beautiful 84-foot Tall Ship. As she pulls away from the dock, you can help hoist the sails if you wish, then sit back in comfort as the wind silently moves the Schooner Pride through the waters of one of the oldest ports in the country. There's more! During each 2nd Sunday Sunset Sail you'll taste fine curated wines and delightful hors d'oeuvres selected for our audience of forty lucky guests. Bring your camera for spectacular shots, or just enjoy a glass of fine wine while you have an unforgettable experience. April's Inaugural Sail was a beautiful evening and the setting sun did not disappoint. Photos were made and wine was enjoyed. We tasted five wonderful rosés from all over the world, perfect for a Spring cruise and setting the model for a new experience every month. Fine wine, a fine sail and a great beginning or end to your week, that's the 2nd Sunday of every month. CLICK HERE TO PURCHASE YOUR TICKETS AND SEE OTHER GREAT SAILING OPPORTUNITIES WITH CHARLESTON HARBOR TOURS.